Description of "Better Than All Happy Ever Afters"
"Better Than All Happy Ever Afters" is an anthology of love. This anthology features a fragrant bouquet of love-narratives, which envelops an array of genres such as poems, articles, and short stories on love. You can also use this book as a journal of love. There are spaces for notes in this book that you could use in order to make short write-ups on your journey of love. The book also features dozens of love-quotes from philosophers to authors, old and new. It's a complete manifesto of love and romance that will take you into a world where love is in the air and songs accompany your every footstep. If you are moved by reading this book as I did, gift this book to someone special as a beautiful present. 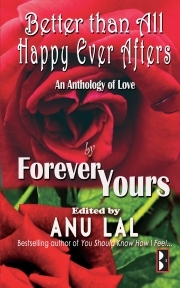 "May in your life, love be abundant"
This anthology is edited by bestselling author ANU LAL. Reviews of "Better Than All Happy Ever Afters"